Matthew Fitt is a popular and well-known children’s author. He has written over 10 books for children and young people. His most successful children’s books are The Eejits, a translation of Roald Dahl’s ‘The Twits’ and Time Tram Dundee, a history of his hometown for kids. Matthew Fitt is a frequent visitor to Scottish schools. He has visited schools in almost every part of the country from big towns and cities to schools of only 3 or 4 pupils in rural Scotland. 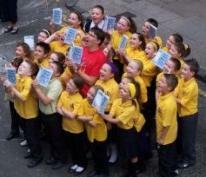 He has also read poetry and led workshops for pupils in London, Prague, Sydney and New York. Matthew Fitt works hard to promote literacy in Scotland’s schools and supports teachers through in-service training and professional development. He writes teaching materials based on his own work, poems and stories by other Scottish writers and on the Scots language. Copyright Matthew Fitt. All rights reserved. Website by Miren Hayek.